The Arthur Rylah Institute for Environmental Research (ARI), located in Heidelberg, is the biodiversity research base for DELWP in Victoria and is a leading centre for applied ecological research. Biodiversity and Agriculture information on this website. 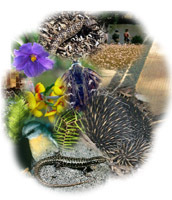 The Museum of Victoria's Bioinformatics website (external link) provides provides public access to some of Victoria’s vertebrate and invertebrate biodiversity. The core of the web site is an enriched dataset that combines over 230 000 faunal specimen records from the Museum's collections, the Victorian Government Wildlife Atlas, Parks Victoria and several private collections. The user can query about the name of an animal, find out when and where it has been recorded as well as other relevant information. It is also possible to find out about the ecological, conservation and protection status of Victoria’s biodiversity. Except for birds and fish, the present web site covers all species of Victorian vertebrates: mammals - 139 species with 162,467 records; lizards - 87 species with 16,819 records; frogs - 34 species with 23,328 records; snakes - 27 species with 2,332 records; together with Victorian butterflies - 143 species with 31,139 records. It is updated as new information is recorded. The Amphibian Research Centre Frogs Website (external link) provides a wide range of information and links on frogs and frog related projects.